News — Zander's Creations Custom made jewelry, in diamonds, colored stones and precious metals. Zander's Creations LLC is now affiliated with Fast Fix Jewelry and Watch Repair. Zander's Creations LLC is now operating inside the Fast Fix Jewelry and Watch Repair in Mesa, Az. You can find me there at the Superstition Springs Mall. I have a wide verity of custom made jewelry that I have designed. Everything from colored gemstone earrings, pendants and rings. I also have wedding rings and bands. Exquisite 1 carat round diamond filigree halo ring. This exquisite 1 carat round diamond halo engagement ring is available in 14k yellow or rose gold. It is the absolute perfect way to say I love you to that special someone. She will have compliments for the rest of her life with this ring. It is comfortable and easy to wear. With 2.011 carat total stone weight, in a G to H color, SI1quality and Very good cut and many hours of hard work. This ring is sure to please any wife or spouse to be! Very beautiful ring. She will be proud to wear a custom designed ring by Zander's Creations. Inspired by the Pokemon TV Series and Pokemon Go Game. I have released a Pokeball Neckless It's currently available for purchase on Etsy.com at Zanders Creations. Stay Tuned for more Pokeball Pieces Coming Soon!!!! 20mm 14k Rose and White Gold Pokeball Neckless. Custom designed ring for Salena. This ring was designed to incorporate the stones from three previous individual rings that she had owned throughout her life. To create one beautiful ring!! 14k white gold using customers stones. Platinum and 18k yellow gold DNA ring!!! Platinum and 18kyellow gold DNA ring!!! Newest edition to my Bridal Collection. The Diamond Halo 14k engagement ring is the perfect way to say I love you. With 3.5 carat total stone weight in G SI1 Quality and many hours of hard work. This ring is sure to please any wife or spouse to be! Very beautiful ring. She will be proud to wear a custom designed ring by Zander's Creations. In 2014 Zander's Creations went through some major changes. The business went from a partnership to sole proprietor. Which means that all designs and manufacturing will be coming from Wayne Cook. With change comes new growth and new ideas. Here is one of the latest custom designs that was made for Christmas of last year. Zander's Creations utilizes computer aided design software from Gemvision. 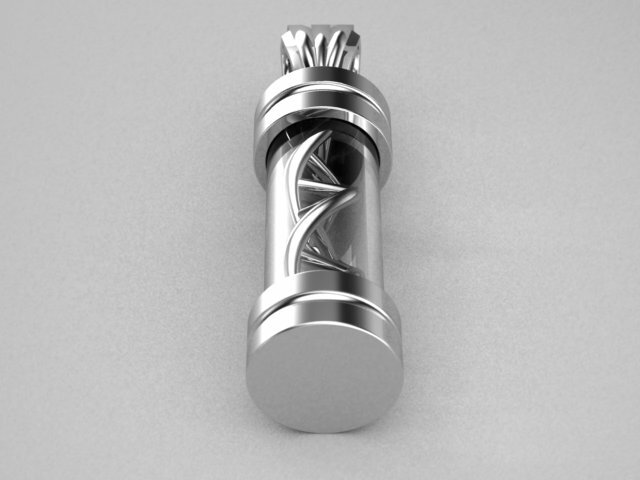 This has revolutionized our design capability and greatly improved quality of finished pieces. We are able to create new pieces much more efficiently than traditional hand carving or metal fabrication. Combining the old methods with the new allows us to make anything, only limited by our imagination. Additionally, with the purchase of a B9 Creator 3D printer, or casting houses which specialize in rapid prototyping we can send the computer file out to be casted in metal of our choice. Computer aided manufacturing has become very popular in the last decade due to various desktop 3D printers such as makerbot, B9 Creator, reprap and many many more. The price point of these machines has dramitcally reduced in the last 5 years due to technological advancements and innovation of very creative people. The B9 Creator rivals machines 10x the cost allowing us to create high quality pieces we were previously using casting houses to complete for us. We will continue to invest in equipment like these to bring you the best designs that are out of this world! I made a video with one of our recent designs spinning in it so you can see all angles of the piece. Is this something you would want to see all of our pieces have? Recently, I have finished a few new wedding rings and wanted to share them with you. These two are based around the radiant and princess cut diamonds. Accented with round diamonds they will make a nice engagement ring or as a great addition to your existing jewelry. Clicking these will bring you to the product page. Last year on that day, our DNA band was very popular and was posted on many various social networking websites. 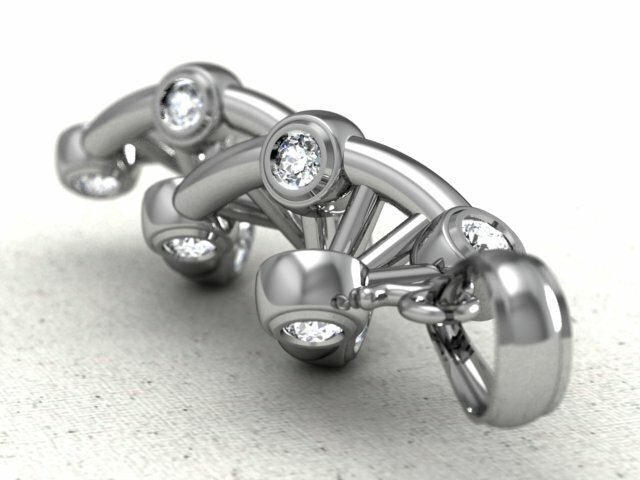 We designed that ring back in 2011 but the concept was made years before, when we first bought our 3D modeling software. The ring below was the final result. You may click it to go to the products page. As a fan of science I felt the DNA symbolizes technology and wanted to capture this in a ring. The one we sell on our website here and https://www.etsy.com/shop/ZandersCreations are the only originals! We have come up with many other concepts as well. Look through the gallery below. We can make things only limited by your imagination! Much of these are for sale or will be shortly. We just got back from the tucson gem show and are excited about what we got! We will be making many new pieces this year with nice colored gems as the focal points. Stay tuned and check back often to see them. Next year will be even better when we go again. We may also attend the jck show in Vegas in the summer as well. Art Deco style ring in 14k white gold with diamonds, amethyst and green stavorites. Get Updates and special deals from us!